Help Me Win Up To $26,000 For My Art Business! I’m excited to announce that I have recently submitted an application to the FedEx Small Business Grant competition. This is an annual competition for small businesses to potentially win the grand prize of $25,000, second prize of $15,000, or eight winners who get $7,500. As you can guess, there’s a lot of competition! Thousands of businesses have signed up and only the top 700 will even get looked at. Then they’ll narrow those down to the top 100 and those businesses are asked to fill out more information, and then they choose the top ten to win the grant prizes. How do they narrow down to the top 700? YOU! The top 700 that will be scrutinized further are based on votes. The businesses with the most votes are the ones that will get into the next round! That’s where you come in. 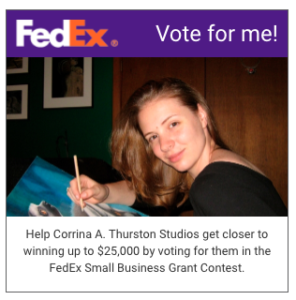 In order help my art business expand and potentially have a space within my community, I need you to vote for me here. Sharing with your friends! You can vote once a day and I would be so appreciative if you could share this with your friends to get some of them to vote too. The deadline for voting for this grant is April 4th, 2018. You can vote once a day, but no more than that. You can, however, share it with your friends and family and on social media, etc. as much as you like. You can’t buy votes or incentivize anyone to vote, but you can share it as much as you’d like. Voting is easy! The link will bring you to my application page and there is a button that says “Vote for this business.” Click that and they’ll ask you to verify your identity (just to make sure you’re not voting a bunch of times) by providing your name and email. Then hit Vote, and that’s it! It takes about 10 seconds total! Deadline for the $25,000 grant voting is April 4th! And the deadline for the $1000 grant is April 1st! You might be doing the math and wondering why the title says $26,000, and the grant mentioned above is for $25,000. Well, I’m also a finalist for a different, completely unrelated, $1000 grant for my art business! Vote here for the $1000 grant. For this grant you can only vote once from each IP address, meaning if two of you are using the same internet source, only one of you can vote, unfortunately. But if you do it on your phone, taken off the WiFi, you might be able to vote like that, because it’ll show a different IP address. I couldn’t (and wouldn’t want to) run this business without the support from all of you. I appreciate every time you like one of my posts, leave a comment, email me, and make a purchase. The number of you who have come out and shared and voted for me already for the $1000 grant has been incredible. I’m humbled by all of your support!